First, you should be able to easily feel – and count – your dog’s ribs when you lightly run your fingers across the side. Next, when you look down on your pet from above, you should see an hourglass figure or an indentation near the midsection. If your pet looks like a blimp from above, it’s probably overweight or has obesity. Finally, when you observe your pet from the side as it stands, you should see a slight tuck or upward slope of the tummy. If the abdomen hangs low and drags near the ground (a condition in cats Dr. Ward calls “Swiffer cats”), that indicates the most dangerous and biologically active form of fat, abdominal fat, is present. I hate to tell you this, but for the past 25 years I’ve been diagnosing a lot of pets with obesity. Part of the reason is due to the fact that I’m a veterinarian whose area of interest is obesity; the other part is that pet obesity is becoming more prevalent. This is an incredibly important issue because pets with obesity are at increased risk for developing serious weight related disorders such as diabetes, arthritis, high blood pressure, kidney disease, cancer, and more. We must do better. To help you better care for your dog or cat, I’d like to share the top five questions you need to ask your veterinarian to keep your pet healthy. They’re simple, won’t embarrass you, and just may save a pet’s life. 1) Is my pet overweight? As a concerned pet owner, you need to understand your pet’s weight is one of the most influential factors of longevity, quality of life, and disease prevention. 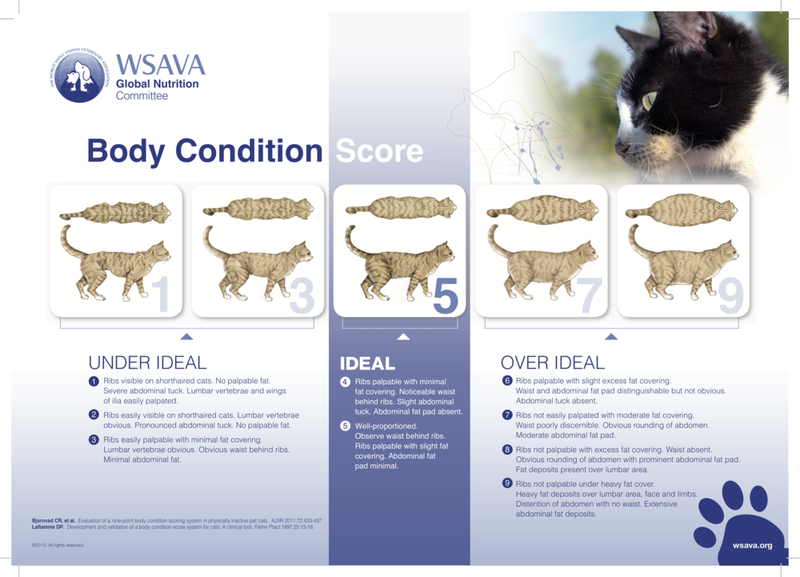 To answer this question, your veterinarian will likely conduct a couple of measurements, determine a Body Condition Score (BCS - see above charts), and determine your pet's current weight status. Ask the question. Demand a thorough assessment. Don’t be offended if the answer isn’t what you expected. This isn’t personal; it’s your pet’s wellbeing. 2) How many calories should I feed my pet each day? We’ve got to be specific when it comes to feeding our pets. Don’t fall into the trap of inquiring, “How much should I feed?” You’ll probably get a generic, inaccurate response. You need to know the precise numbers of calories and nutrients your pet needs. That way, regardless of the type, brand, or formulation of food you feed, you can determine how much to feed. This is a subtle, but incredibly significant difference. Healthy nutrition is about feeding your pet proper nutrients, not ingredients. Your veterinarian should then ask you a few lifestyle questions, perform a couple of calculations, and give you a narrow range of daily calories you should feed. Memorize this number. Find out how many cups or cans of your pet food this equals. Feed that amount. Don't forget to include any treats in your daily caloric counts. Those tiny “calorie grenades” can swiftly sabotage the best dietary plans. 3) How much weight should my pet lose in a month? If your pet is like the majority of dogs and cats, it’ll need to shed a few unhealthy pounds of excess fat. You need to ask how much weight your pet needs to shed and how long will it take to reach a healthy weight. I prefer to think in terms of pounds per month due to practicality and performance. Monthly weight checks are practical and reasonable for even the busiest pet owners. A weight loss plan’s performance is critical to track and monitoring monthly trends is an accurate indicator of success or stagnation. In general terms, a dog can safely lose 1 to 3-percent of its body weight and cats 0.5 to 2-percent per month. Many dogs can lose 3 to 5-percent and most cats should aim for about a half-pound per month. Losing weight isn’t easy or fast for pets, especially cats. If you put your pet on a “crash diet,” they can develop serious medical conditions, including a life-threatening form of liver failure that can occur in less than 72 hours. Patience is essential with pet weight loss. Most of my canine patients will have a 3 to 6-month weight loss plan and cats 6 to 12-months. Your veterinarian will probably formulate a step-weight loss plan that will gradually decrease the amount you’re feeding over a 1 to 3-month period. This will help curtail cravings, begging, and late-night pestering. Note I said “help,” not “eliminate.” There will be some unhappy pooches and purr babies when you institute a diet. Your veterinarian should provide you with tips on preventing these behaviors and transitioning to a new weight-loss diet. 4) What kinds of exercise should my pet do? Most veterinarians and pet owners focus on how long a pet should exercise each day. While that’s an excellent approach, I also advise asking what types of activities are best based on your pet’s species, breed, age, gender, and current physical abilities. Walking, swimming, agility, chase, ball retrieving, and remote controlled toys – the opportunities for physical activity with your pet are limitless, but determined by physical ability and intellectual interest. The general recommendation is that dogs need at least 30-minutes of physical activity a day and cats should strive for three 5-minute intense play periods. How you spend those minutes will determine if you do it or don’t and if you adhere to those activities. Make your outings enjoyable, entertaining, and interactive. Cat owners, please don’t forget to ask this question. Whether you play with a feather duster or laser pointer, move the food bowl, or use a hip, high-tech toy, engage your cat’s inner predator and encourage it to pounce, leap, and prowl every day. I’m a huge fan of pet activity monitors. They’re a great tool to document how much your pet is walking or playing each day. Better yet, you can share these reports with your veterinarian to identify any deficiencies or ways to optimize your training. 5) Is my pet at risk for a medical problem due to excess weight? This is a very serious question that you need to understand for your pet’s future. Dogs and cats with excess fat are at greater risk for developing diabetes, arthritis, high blood pressure, kidney disease, and many forms of cancer. You need to have a frank conversation with your veterinarian to find out if your pet is potentially facing one of these weight-related disorders. If so, what can you do to reduce their odds of developing on of these conditions? Preventing disease is my primary focus and one of the reasons I’m so passionate about the importance of maintaining a healthy weight and proper nutrition. The most important decision you make each day about your pet’s health is what you choose to feed it. Choose wisely; your pet’s longevity and quality of life depends on it. It’s never too late to reduce your pet’s chances of contracting one of these serious disorders. Early recognition and awareness is the best defense against many diseases. Begin by asking these questions. So there you have it, my five biggest questions you must ask about pet obesity. Of course, there are many more topics you need to discuss during your time with your veterinarian, but your pet’s weight should be covered at every exam. The few minutes you spend on diet and weight could be the difference between two additional years of high-quality life or a shortened, suffering final stage of life. Take the time to write down these questions, ask your veterinarian, and act on the answers. Together, you and your veterinary healthcare team can chart a course for a better, longer, and happier life for your pet. It’s totally worth it.